Tending Land. Growing Food. Learning Skills. Building Relationships. A full share will average 10+ items per week, depending on season and weight, for 25 consecutive weeks. Early summer season shares will include a higher ratio of leafy greens such as lettuce, kale, chard, bok choi, and spinach. Mid-season shares include a higher ratio of fruits such as tomatoes, summer squash, peppers, plums, and early apples. Late-season shares include a higher ratio of winter squash, tomatoes, peppers, potatoes, and other fruit and root crops, along with a second wave of cool weather greens. A full-share is ideal for a household of 4 supplementing their staple foods with fresh foods from the SCA, or for a household of 2-3 eating a higher amount of fresh produce. For those looking for the equivalent of a half-share, we encourage you to partner with a friend or neighbor with your weekly SCA and alternate pick-up weeks. Click the image above to purchase your 2019 Jean’s Farm Full Share. Welcome to the Jean’s Farm and Sotoi Gardens CSA, where you can expect a steady supply of fresh greens, roots, and herbs throughout the season. The 2019 CSA will be a 25-week season and will run from approximately mid-May through he end of October. Shares will be $500, averaging just $20 per week for the freshest, local food grown using organic methods. Shares will contain a steady supply of salad mix and other greens, root veggies and herbs. Warmer weather vegetables will become available in summer and fruits towards late summer and fall. Each week will consist of 9-14 items. Bags will have more items in mid summer to early fall and will be heavier. Bags with a higher ratio of greens (towards the beginning and end of the season) are typically lighter. Each week will consist of a few items from each category as noted in chart but number of each item can vary from week to week. Variety will also vary from week to week from list provided. The weight and value of produce from week to week will vary and averages out over the season. Also by signing up, you are getting produce at a discounted rate. Over the season, bags of produce would average $25-$30 per week and you will be paying $20 per week. We will provide two pick-up locations for 2019, Milwaukie Cafe in Milwaukie and the Planet Repair Institute in Sellwood near the New Seasons. Shareholders will be able to pick up their produce at the designated location each Saturday morning. This form of farmer-community relationship, known as Community Supported Agriculture, allows you to get the freshest food possible at a low price, because you are buying direct. We, the farmers, benefit in receiving payment up front to cover production costs, and you, the shareholder, get to know your farmers, our practices, the land, and have opportunities to volunteer a handful of times throughout the CSA season. Shareholders are encouraged to volunteer a few times over the growing season, generally at our Friday morning work parties, and occasional Saturdays, to develop a closer connection to the source of your food and help with farm tasks. Through your participation, you are able to gain gardening skills and build community while you help support the best way to get access to healthy food! 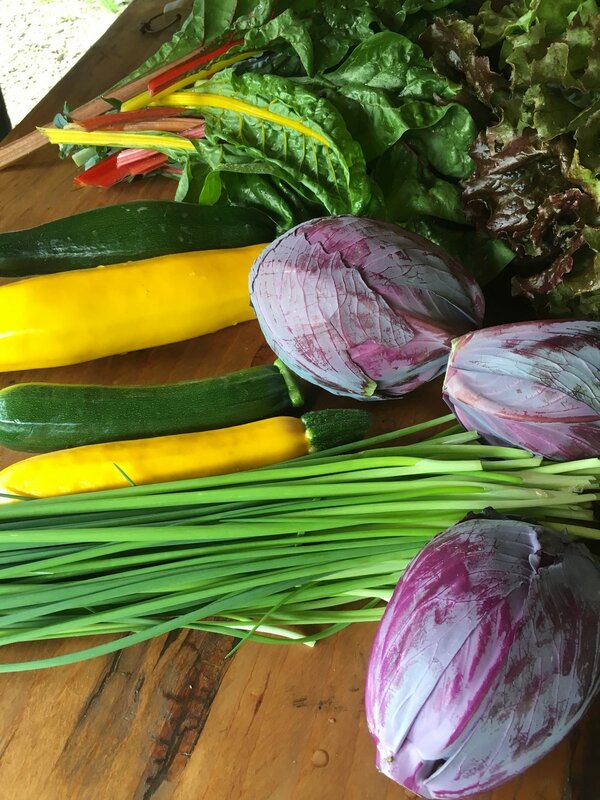 Jean's Farm, Lovina Farm, and Sotoi Gardens are proud to supply SE Portland and North Milwaukie residents with a local option for fresh produce grown using organic, soil-building and wildlife-friendly practices. Our vegetable sales support the charitable work of our non-profit as an educational farm, and the vast majority of the effort in producing our produce is offered through volunteer hours. Henry Soto has been farming organically for over 20 years. He grew up farming in the desert of Arizona, worked for Native Seed Search for 6 years as a crop evaluator, and managed a CSA in southern Arizona for 5 years before moving to the Pacific Northwest. He also teaches classes on farming, irrigation and seed saving at Jean's Farm. Matt Bibeau has been working in the field of garden-based education since 2005 and has taken roles growing food, coordinating the farm's educational programs and co-teaching workshops and trainings for adults. In making the transition to CSA farming in 2016, Matt is excited to help families in the Johnson Creek area gain access to affordable, healthy food.